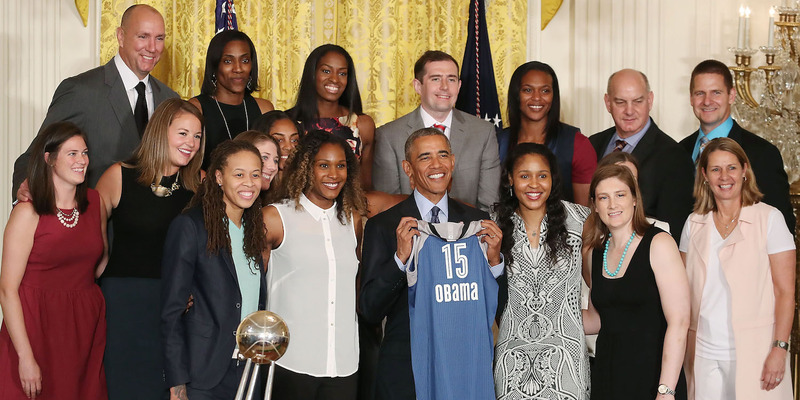 Mark Wilson/Getty ImagesThe Minnesota Lynx visiting President Obama at the White House after winning the 2015 WNBA championship. The Minnesota Lynx were not invited to visit the White House in honour of their most recent WNBA championship. The Lynx had previously made White House visits. Instead, the team will spend time giving away socks and shoes at a public school. President Trump also recently withdrew the invite to the Philadelphia Eagles to attend the White House. The Minnesota Lynx, the reigning champions of the WNBA, were not invited to the White House for a ceremony honouring their achievement, as they had been after their three previous WNBA championships, according to Kent Youngblood of The Star Tribune. Instead of a White House visit, the team will give away socks and shoes at a local school, in partnership with the charity Samaritan’s Feet. This news about the Lynx comes on the heels of President Trump dramatically withdrawing his invite to the Philadelphia Eagles to attend the White House, most likely due to how few Eagles players would have shown up. However, no clear reason was given for why the Lynx were not invited to the White House. And, as noted by Youngblood, LeBron James recently expressed disappointment that the Lynx were not invited to the White House.